The digital world is part of daily business of companies, organizations and authorities. E-mail communication has become the most important business communication tool of everyday life. Not only are documents and contracts exchanged electronically, but also important agreements are often confirmed by e-mail. E-mail communication for such important businesses may seem to be an easy and simple way of communication. However, as a responsible company, you have to think about the accordance with law, too. Unfortunately, the exchange of information via normal e-mail is not secure at all. Content can quickly be read by unauthorized third parties. Additionally, sender and content can be changed without even noticing. This makes it impossible to prove normal e-mail messages in a legal dispute. But there’s a solution. Signed and encrypted e-mails provide security. Therefore, you can make use of all advantages of e-mail communication without any of the disadvantages. The electronic signing of e-mails ensures the proof of origin and the immunability of the e-mail. Further, the identity of the sender (authenticity) is clear. Therefore dubious e-mail senders can be marginalized. The PrivaSphere Signature & Policy Management Service requests e.g. the QuoVadis Secure E-Mail Certificates directly via an automated and highly secure process. The personal certificates are stored centrally on the platform and are available to users for automatic signing. PDF attachments can easily be signed by PrivaSphere PDF Signature Service. It is an Advanced Signature, which mean, that signed PDF files fulfill the needs for electronic invoices automatically (proof of origin and immutability). To ensure this, the Advanced Signature suffices. For existing users of the E-Mail Signature Service, the one-time installation effort is minimal. The perfect solution for simply signing PDF files and sending them in compliance with legal requirements, also from your special applications (e.g. invoicing and pay slip shipping) or other applications (for example Outlook ). Just add the control tag <sigAtta> to the subject line. This adds a signature to the PDF file with a unique sender and cryptographic integrity protection. Signing certificates can also be used for encryption. Therefore, it may happen that incoming e-mails are encrypted by your communication partners with the signature certificate. 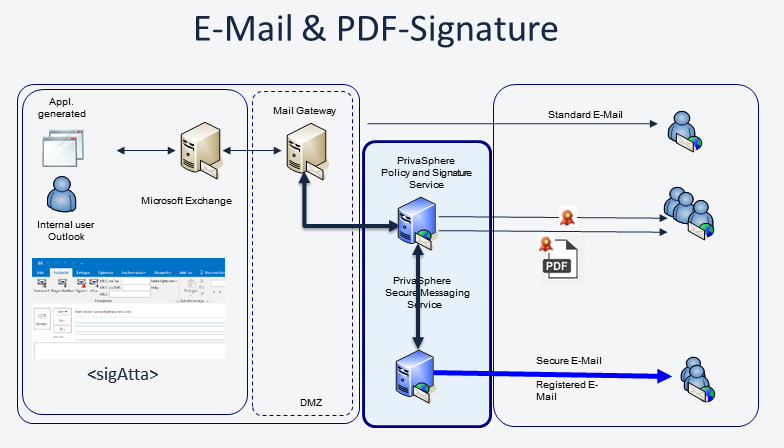 Send the encrypted email via the PrivaSphere Signature & Policy Management Service as an attachment to decrypt@privasphere.com (via "drag & drop" in the mail program). Afterwards, the e-mail is decrypted via PrivaSphere Secure Messaging and safely delivered to you. If this happens more frequently, then - depending on the technical possibilities of the customer - the incoming eMail traffic can be directed wholly or selectively only the encrypted messages via the PrivaSphere service and the decryption takes place automatically. 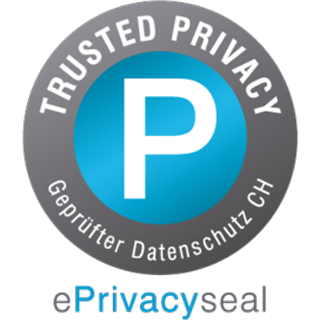 PrivaSphere Signature & Policy Management Service provides the ability to send an e-mail confidentially by the PrivaSphere Secure Messaging Service. This also guarantees confidentiality and with «eGov registered» the legal capacity. PrivaSphere Secure Messaging also enables a HIN integration. PrivaSphere Signature & Policy Management Service also provides detailed rules for controlling inbound and outbound e-mail traffic. These include sender and recipient-based rules for signing and encrypting, blocking e-mails from addresses, or integrating data leakage prevention (DLP) systems and inserting footers. There is also a sophisticated system for managing authenticated TLS connections when exchanging confidential emails with partner domains. Incoming e-mails can be processed automatically. Existing digital signatures can be «harvested» and used for fully automatic encryption of outgoing e-mails. The domain's security officer has control over it using the management console and can control the process precisely. He also has the ability to monitor the mail traffic by means of detailed logs and analyzes of the used encryption.